Mike Borassi removed, Spencer Duhm joins cast. Ep1 hike. 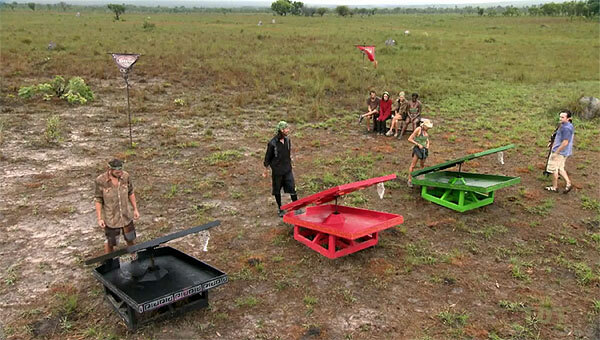 After each tribe 'votes out' one person based on first impressions (Sandy, Sierra), the tribe must hike to camp carrying supplies, while Sandy and Sierra get a helicopter ride to their respective camps, and are given the choice of looking for idols or setting up camp. Filming begins, 4-hr hike to camp for all but Sandy, Sierra. Ep1 RC/IC: A River, Run Through It. 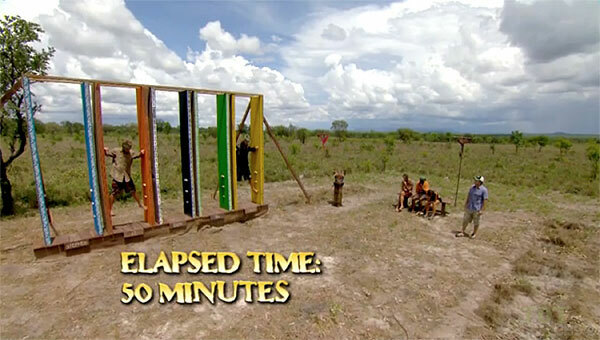 Two tribemates (Taj, Sandy; Erinn, Sierra) stay behind to work the puzzle. The rest run over a series of dunes to a river, and wade out to a raft carrying puzzle planks. Once all reach the raft, it can be dragged back to shore and unloaded. Planks must be returned to the start to build a staircase puzzle. Once complete, the tribe climbs the stairs, and two more people (Erinn, Brendan; Sydney, Spencer) work a table maze. Timbira passes Jalapao on the table maze, wins flint and immunity. Ep1 RC/IC: "A River, Run Through It" - Timbira wins. 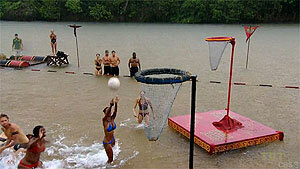 In knee-high water, groups of three people from each tribe try to shoot a basket. First to three wins. Scoring: Candace, Tyson (Timbira up, 2-0), then Sydney, JT, Stephen. Jalapao wins, 3-2. 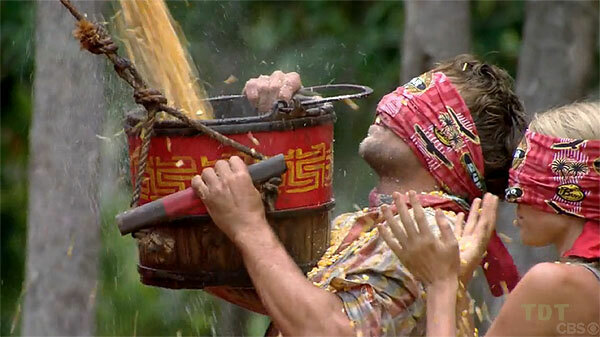 They exile Brendan, but Probst reveals a new twist: Brendan can choose a person from the winning tribe to join him, and he picks Taj. Ep2 RC/IC: "Beach Brawl" - Jalapão wins, Brendan and Taj exiled. TC2 - Candace voted out (7-1), 14 left. Joe and Debbie are callers. Rest are blindfolded and work in pairs. Callers must direct pairs to pick up a bucket, fill it with water, return to the start and empty it down a chute, filling a larger bucket. When full, the bucket drops, raising a flag. Then the process repeats with corn instead of water. Jalapao does both before Timbira even finishes their water, wins a tarp and blankets. 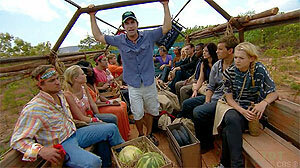 They select Brendan for exile; he picks Taj to join him again. Ep3 RC: "Blind Leading the Blind" - Jalapão wins, Brendan & Taj exiled again. Brendan & Taj return. In pairs, contestants race out to retrieve one of six large cubes. 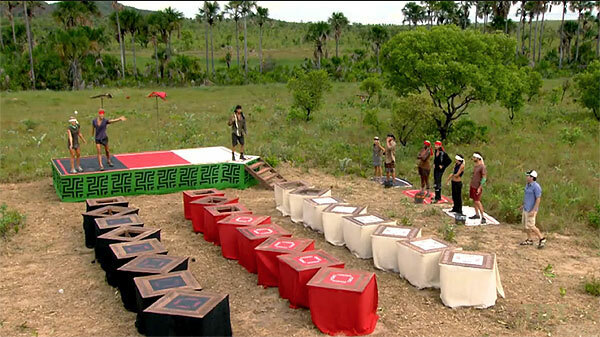 Once all six are retrieved, they must be arranged to form a staircase puzzle with their tribe's name along one side. Despite a slight Timbira lead in retrieving the cubes, Jalapao wins. Ep3 IC: "A Crate Idea" - Jalapão wins. 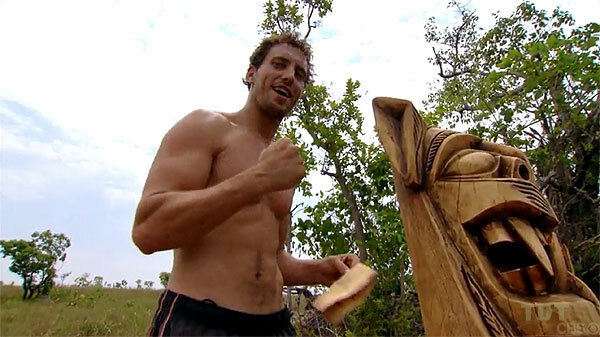 Using the second clue from Exile Island, Brendan uses the few hours between the IC loss and Tribal Council to hunt for Timbira's idol. He finds it in the wooden statue by treemail. TC3 - Jerry voted out (6-1), 13 left. Stephen, Spencer; Sierra sit out. Loaders: Erinn, Coach; Sydney, Sandy. Weight-bearers: Joe, JT, Taj; Brendan, Tyson, Debbie. 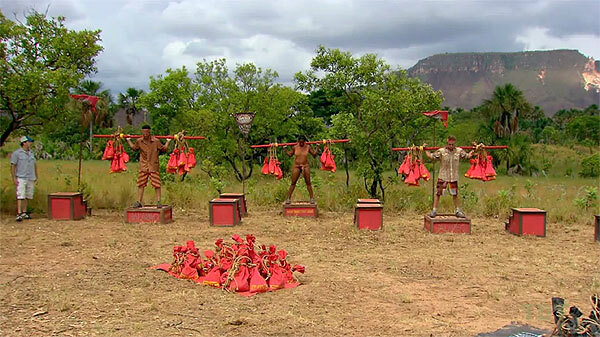 Loaders decide which person on the other tribe gets weight, then each tribe's loaders place two 10-lb sandbags on the weight-bearer chosen. Brendan drops as he gets 220, Tyson drops at 140, JT at 220, Joe at 140, Debbie at 100. Jalapao wins camp raid, exiles Sierra. Sierra picks Taj to join her. Sierra & Taj return. Taj sits out. Contestants must race out along a criss-crossing course, untie a triangular/plank puzzle piece, then return it to the starting line. 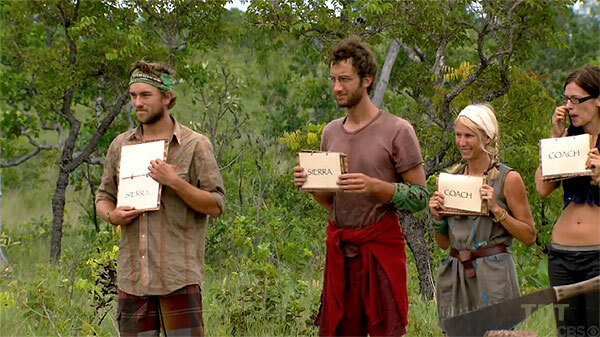 When all 8 pieces are returned, the whole tribe uses them to solve a word puzzle. Pieces have to be both rotated to the right face and in the right order. Timbira gets a minor headstart on the puzzle, and ends up winning. Ep4 IC: "Try Any Angle" - Timbira wins. TC4 - Sandy voted out (5-1-1), 12 left. Using the third clue, Taj and Stephen find Jalapao's idol. Taj gives it to Stephen to hold, because he has pockets. Stephen, Taj find Jalapão's idol. In a series of head-to-head heats, one puller from each tribe (Joe, Stephen; Brendan, Coach) must race out, grab a rope, and pull it back to the finish line, spinning a tribemate sitting on a spool. That tribemate (now dizzy) must then cross a balance beam. First across and to the finish line scores a point for their tribe, first tribe to 3 points wins. Results: Tyson d. Taj (1-0); Spencer d. Erinn (1-1); JT d. Sierra (1-2); Sydney d. Debbie (1-3). Jalapao wins trip to Charmin Café (plus letters from home). They choose Brendan for Exile, he picks Stephen to join him. Stephen & Brendan return. Two launchers per tribe (Stephen, Sydney; Erinn, Debbie), rest are trying to catch launched balls. Results: JT-1, JT-2 (joe w/ his hand, doesn't count, hurts knee), Brendan-1, Brendan-2 (2-2), JT-3 (chips a tooth), JT-4 (4-2), Tyson-1 (4-3), Tyson-2 (4-4), Tyson-3 (4-5, Timbira wins). JT mad at Spencer for not guarding Tyson better. Ep5 IC: "Water Mortar!" - Timbira wins. TC5 - Spencer voted out (5-1), 11 left. Erinn sits out. Each tribe has five minutes to create two barricades, to impede the other tribes throwing of ceramic pigs. After that the challenge requires a chain of tossing (Taj-Joe-JT-Sydney-Stephen and Debbie-Brendan-Tyson-Coach-Sierra) to move as many ceramic pigs as possible to the bench at the end, without dropping or breaking them. Timbira leads, Jalapao catches up, then Timbira pulls away again in the final minute (and wins, 14-13). Timbira wins a waterfall getaway feast, exiles Joe. He picks Erinn to join him. Ep6 RC: "When Pigs Fly" - Timbira wins; Joe & Erinn exiled. Joe & Erinn return from Exile. Debbie sits out. 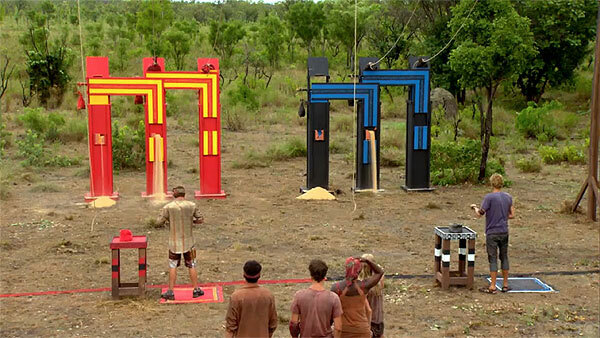 In the first stage, shooters with slingshots (JT, Tyson) must break one of three tiles, releasing sand. Draining sand lowers the next tile, and releases a puzzle bag. 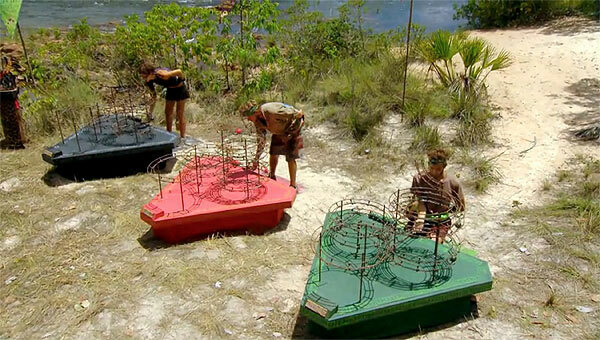 Once all three tiles are broken and the three bags retrieved, two other people (Stephen, Joe; Erinn, Brendan) must solve a rotating snake puzzle. Tyson gives Timbira a slight lead on the puzzle, and they hold on to win again. Ep6 IC: "Sandstone Shootout" - Timbira wins. TC6 - Sydney voted out (3-2), 10 left. Both tribes are sent to the merge feast site via an ambiguously reward challenge-sounding treemail. They merge, feast, and eschew Stephen's suggestion of the name Dingus, instead going with Coach's boring Forza. Tribes merge, feast, form "Forza" tribe. Hold onto a pole as long as you can. Order of elimination: 10. Stephen & 9. Joe out quickly, then 8. Brendan, 7.Taj, & 6.Erinn out soon after. 5.JT (20 min), 4.Coach & 3.Sierra (soon after JT), 2. (30 min) Debbie, 1. Tyson wins. Ep7 IC: "Get a Grip" - Tyson wins. No TC7 - Joe medevacced, 9 left. Three teams: Black (Debbie, Brendan, JT), Red (Tyson, Taj, Coach), White- (Stephen, Sierra, Erinn). 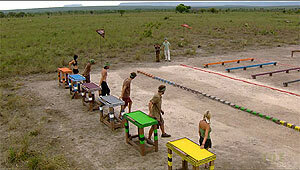 Contestants throw balls underhand, try to break 8 tiles of opposing teams. Erinn gets Red out. Brendan gets white. Black wins white-water rafting trip the next day. They exile Stephen, alone. 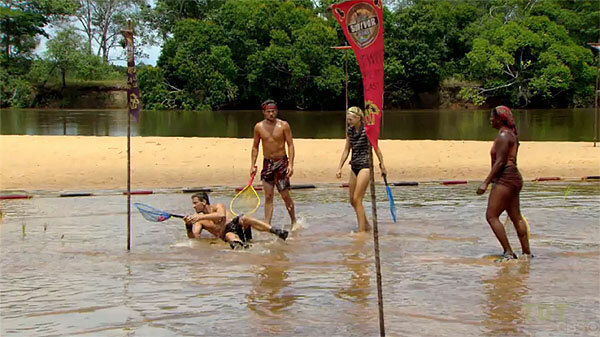 Ep8 RC: "Rock Block" - Brendan, Debbie & JT win a rafting trip; Stephen exiled. Stephen returns from a solo 2-day Exile stay. 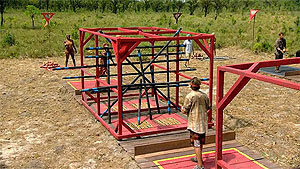 First stage: all 9 contestants must follow a rope around a set of obstacles. First 3 to finish (JT, Brendan, Tyson) advance. Second stage: Follow a rope around a 3-level obstacle. Tyson wins, just beating Brendan. Ep8 IC: "Rope-A-Dope" - Tyson wins again. TC8 - Brendan voted out (4-3-2), 8 left. Two teams: Black (Coach, Stephen, Taj, Sierra), Red (Tyson, Erinn, JT, Debbie). 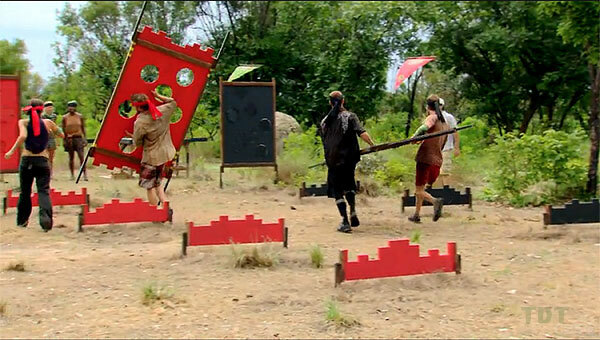 Contestants race out in pairs, untie one of five puzzle boards, then carry them back and place in a holder. Once all five are back, teams must flip and rotate boards until they can look through holes in all five boards to see a vowel at the other end, for all seven holes. They then use those vowel with existing consonants to solve a word puzzle (You've Won A Feast.) Red team solves the puzzle before black even has their boards arranged. They win a trip to a local village to watch capoeira and feast. Stephen is exiled. 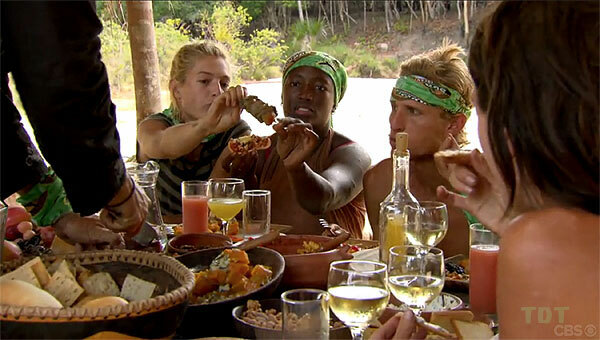 Ep9 RC: "Swiss Cheese Please" - JT, Erinn, Tyson and Debbie win a feast and capoeira demo. Stephen exiled. Stephen returns from Exile. Contestants must choose between competing or eating lukewarm pizza. JT, Coach, & Stephen opt to eat. The challenge is three rounds of shuffleboard, with the winner being the person whose puck is closest to a central X. Several people briefly lead, including Tyson with two shots left. He is then knocked out by Sierra, who is in turn knocked out be Debbie. Debbie wins. 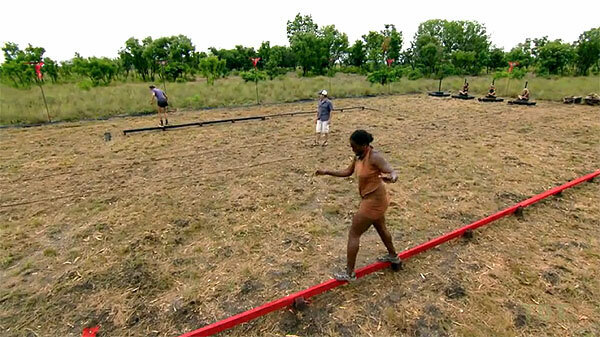 Ep9 IC: "Tocantins Shuffle" - Debbie wins. TC9 - Tyson voted out (5-3), 7 left. Contestants answer a series of questions about each other. After Probst tallies the answers, they must guess the most popular answers. Right answer lets them chop one of three ropes of an opponent. When all three ropes are chopped, that person is out. Results: Q1.Erinn chops Sierra, Debbie chops JT, Taj chops Debbie, Coach chops Sierra(2), Sierra chops Coach. Q2.Debbie chops Erinn, JT chops Sierra (out, 7th), Erinn chops Debbie (2). 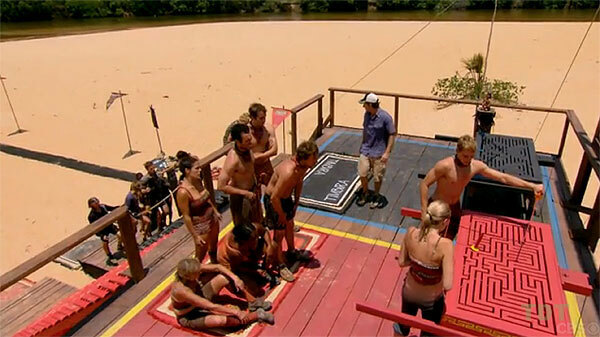 Q3.Taj chops Coach(2), Erinn chops Coach (out,6th), Stephen chops Debbie (out,5th), Debbie chops Erinn (2). Q4. Taj chops JT(2), JT chops Erinn(out,4th), Erinn chops JT (out,3rd), Stephen chops Taj. Q5. Taj chops Stephen, Stephen chops Taj(2). Q6. Stephed chops Taj (out,2nd). Stephen wins a trip to The Fervadora, a natural spring, and exiles Erinn. He takes Taj, then JT on reward with him. Ep10 RC: "Jala-powed" - Stephen wins trip to springs, takes Taj and JT. Erinn exiled. Erinn returns from Exile. Round 1: Contestants must use a grappling hook to retrieve three bags. First three to collect all three bags advance. JT and Coach get their three quickly, then Debbie narrowly beats out Stephen, as both try to pull in their third bag. In the finals, Coach steadily progresses. JT tries to pass him, falls in a hole, and Coach wins. 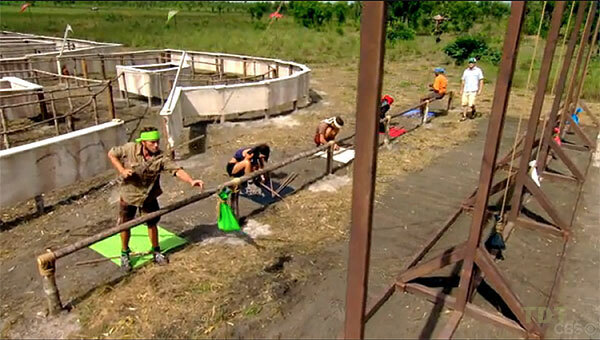 Ep10 IC: "Snag, Drag & Bag" - Coach wins. TC10 - Sierra voted out (4-2-1), 6 left. No Ep11 RC: Auction instead. As usual, everyone starts with $500. Shown bids: Debbie - french fries ($120). Coach - chicken parmesan, wine ($320). JT (covecal-red, $160) - nachos, guacamole. Stephen (covecal-red, $100) - chicken hearts. Taj ($20, after getting gifts from rest) - video from home, visit from Eddie. Taj chooses to exile herself with Eddie, allowing the remaining loved ones to visit the others in camp. Taj returns from Exile. Contestants must dig under a log, cross a balance beam, then a belly crawl, then memorize a series of 10 math symbols spinning on a spindle. Then they must re-cross the obstacles, and enter the symbols (in order) on a puzzle table. Finally, they must use those symbols on a math problem. After initial problems with digging and the balance beam, Stephen accurately recalls all 10 symbols in a single trip, and solves the problem, passing JT and Debbie, who were working on their math problems. Stephen wins immunity. Ep11 IC: "Propeller-heads" - Stephen wins. TC11 - Debbie voted out (4-1-1), 5 left. Contestants are shackled at the ankles, and must navigate a giant maze (in the shape of the letters SURVIVOR). After exiting the maze, they must tie together sticks, then use the sticks to snag a swinging sandbag, then use the sandbag to knock down three levers, releasing a flag. JT wins easily, exiting the maze first. Coach closely follows JT through the maze, but JT has already knocked down all three levers before Coach has snagged his sandbag. The others are still tying sticks together. JT exiles Coach, picks Stephen to join him on an overnight trip to the Governor's Retreat. Ep12 RC: "Blind to Reason" - JT wins resort trip, takes Stephen; Coach exiled. Coach returns from Exile. Contestants must use only their arms and feet to hold themselves up on a series of three decreasing-in-size footholds. After 15 minutes, they must move down to a smaller size. All five last 30 minutes, but 5.Erinn falls on the transition to the smallest foothold. 4.Stephen and 3.Taj fall out shortly thereafter. Coach and JT last over 50 minutes, but then 2.Coach falls, and 1.JT wins. Ep12 IC: "Chimney Sweep" - JT wins. TC12 - Coach voted out (3-2), 4 left. 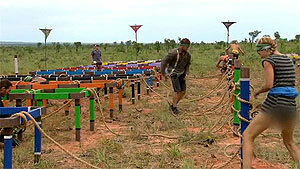 Contestants must go through the legs of a tarantula-shaped series of tubes, and retrieve three puzzle bags. They then empty the bags and complete a web-shaped puzzle. 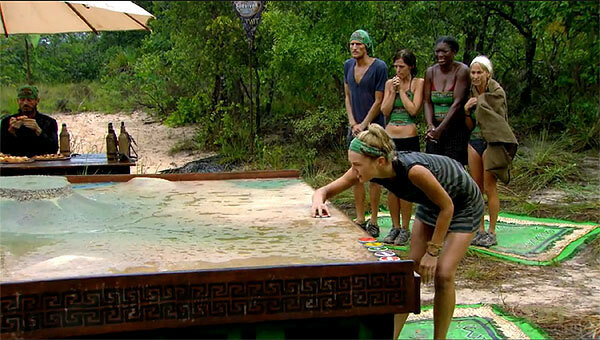 JT has a huge head-start on the puzzle, but is nearly passed by both Stephen and Erinn. But with only one or two pieces left for the others, JT wins. Ep13 F4 IC: "Tarantula" - JT wins. TC13 - Taj voted out (3-1), 3 left. 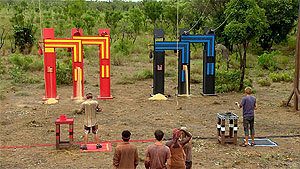 With one hand tied behind their back, contestants must place a ball at the top of a long, twisty track, then catch it when it exits at the bottom. Each time through the ball flips a gate, sending it to one of two possible outlets. As time progresses, another ball is added, to make it more difficult. Erinn drops out at three balls, followed by Stephen shortly after the switch to four balls. JT wins one final time. Ep13 F3 IC: "Simmotion" - JT wins. TC14 - Erinn voted out (1-0 or 2-1), 2 left. After Stephen faces a skeptical jury while largely avoiding speaking negatively about JT, JT attacks Stephen's veracity, and sweeps the jury vote, 7-0. Final Tribal Council and jury vote on final two - JT wins, 7-0. Departure. Contestants return home to U.S.
Contestants continue to return home, resume online activity. Bleary-eyed Probst posts final Gabon blog entry for EW.